Share "What Is Catnip and Why Do Cats Go Crazy for It?" Every cat owner has offered their cat a sniff or taste of catnip and giggled at the ensuing nuttiness of their furry friend, but what exactly is catnip and why do cats go head over paws for it? Catnip (Nepeta cataria) is an herb in the mint family. It is a perennial plant, originally native to Europe, Asia and the Middle East, but now widely cultivated throughout the world. Also known as catswort, catmint, field balm and many other names, this plant is used in many ways, including for its mildly sedative effects on humans and medicinal uses in different forms, including teas. Most familiar, however, is its use for feline entertainment. Hyperactive energy, leaping, running, etc. Exactly how any individual cat will vary depending on that cat's sensitivity to the herb, as well as how strong their exposure is and how fresh the catnip may be. The effects of the catnip will usually last 10-15 minutes, and after that time it may take up to several hours for a cat to reset its olfactory sensitivity so it will react to another dose. 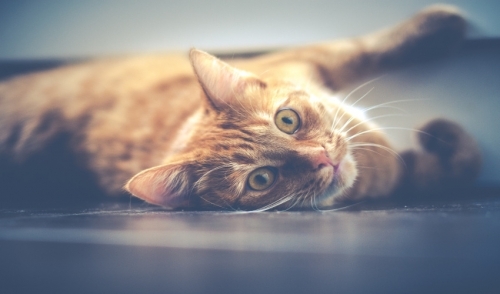 Though the "crazy cat" effect of catnip may seem extreme, particularly in sensitive felines, there is no evidence that catnip is in any way harmful to pets, and they cannot "overdose" on the herb. It is not generally recommended for pregnant cats, however, because the dramatic change in their behavior could cause injuries, and it is unknown if the effects of the herb might be transferred to unborn kittens. Kittens under six months old are generally less sensitive to catnip as well, and until they are more mature, it is best to hold off on the catnip toys. For adult cats in good health, however, a catnip toy or chance to nibble on a fresh catnip leaf can be gloriously entertaining and enjoyable for both the cat and its owner.